Using Google App Engine is really easy for developers, you can use the language you prefer (Java, Python and a bunch of dynamic languages running on top of the JVM) with the usual API. ....but after a while you feel that something is "wrong". Yes, you are using JPA but your "relations" doesn't work as expected and even if you read something about the fact that the underline store is not SQL you don't realize immediately that SQL is only the top of the iceberg. Because the DataStore is even not a Relational Database. After being shocked for a while I decided to study how this piece of software works (not much infos in my opinion on official GAE site), because to work well with it you must think the way it was designed for. Let's start with a formal definition. 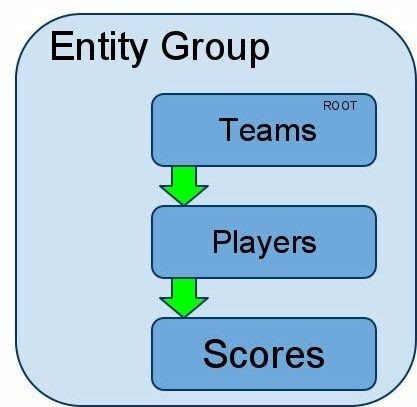 "Google App Engine Datastore is a schema-less persistence system, whose fundamental persistence unit is called Entity, composed by an immutable Key and a collection of mutable properties. Entities can be created, updated, deleted, loaded by key and queried for properties values. DataStore is consistent and transactional, with support to current transaction. " "A Bigtable is a sparse, distributed, persistent multi-dimensional sorted map"
The two "anchor" columns instead have only one version containing the link description text. Those rows are stored inside the Google cloud in tablets. Every single tablet contains a range of data lexicographically ordered by row and is the minimal unit of distribution and load-balancing (about 200MB). It's really important to store rows with keys that minimize the number of tablet accessed, to maximize efficiency, hence performance. Another interesting abstraction in BigTable is the one we can do with "column families", which is a group of column which represent the same concept, for instance "anchor:com.yahoo.www" and "anchor:com.google.www" are two columns that represent the concept of family. A column is always represented with the syntax "family:qualifier" and they are not only used to represent similar concept, they are the minimal unit of Access Control. For every "column family" in a table we can decide who can read, write and/or update. The last concept that we must understand to work with BigTable is the "timestamp", a 64bit integer that remember the long field we use for optimistic locking in many ORMs. Here it's used to have many versions of the same row into the table, and for this reason we have to choose some policy for creation of a new version and garbage collection of old versions. We can decide to keep version newer than time T, or may the last n versions, this is a choice of the developer that it's using the table (unfortunately versioning is a BigTable's feature that we can't use in DataStore). where the row with key1 and key3 are selected. We must also be aware that using indexes is not an holy grail, being fast is not a matter of having the index, but a right balance between them and the time we spend updating them at every insert. In fact, while the index is not size sensitive, the number of indexes impact very much the insert time of rows in a table, because every index must be updated. Here is clear that "key1" is selected because it follow the path from the first index to the last. Teams/Fiorentina (ROOT) fullName: "ACF Fiorentina SpA"
Here the ROOT Entity (Fiorentina) is the key for the transaction to work. All entities in this entity group refer to its version timestamp, which is like a flag about a well done transaction. If all is gone well then the commit updates this timestamp to flag that the entities in this group are all ok. If something went wrong nothing is done on the root entity and dirty entities (those without a valid ROOT entity) will be later garbaged. We can note that we only need to persist the ROOT entity and that we have utility methods (addXXX) that manage the inverse mapping necessary for a real ownership of an object. In case something goes wrong before the commit, all will be rolled back. We are managed to think "relational" because the winning technology in the last 35 years is the Relational Database Management System. Often we think that everything can be well designed with the relational model, but this may be not true, just think the effort we need to do every time we map our Java objects, also with modern ORMs. This is not only a technological challenge because this time we have to work on out "forma mentis" in order to fully use the new Cloud-Computing tools that Google and other vendors are going to provide us.